Both my mom and Ross' mom came for a visit to celebrate Christmas. 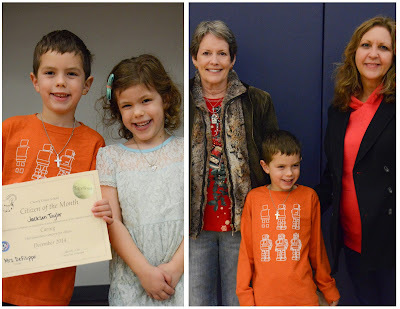 They were able to join us Friday for Jackson's school assembly where he was named "Citizen of the Month." Then on Saturday we made our way to Martin Ranch Winery for a picnic and some wine tasting. It was a little overcast and wet due to all the rain we've had recently, but it was still a lot of fun! The wine was wonderful too! 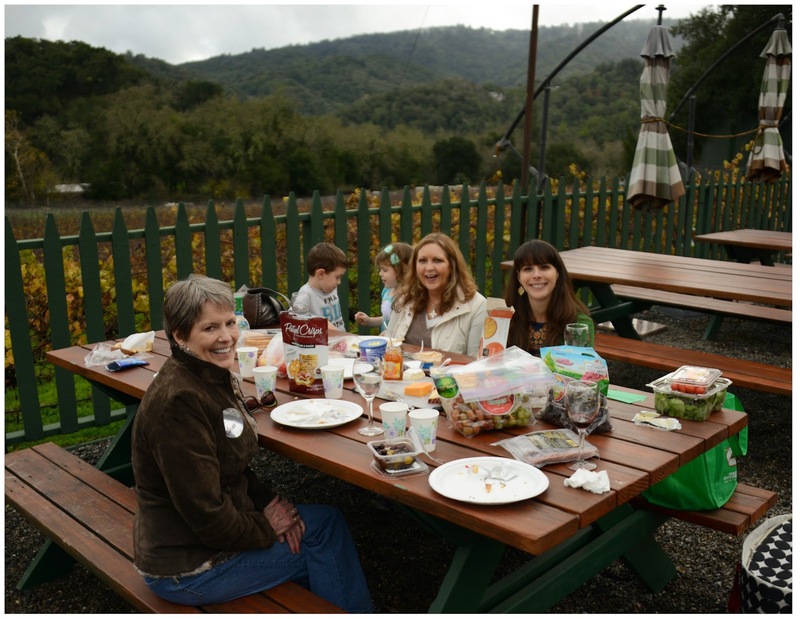 After the picnic, we exchanged gifts with my mom and enjoyed a delicious, pre-Christmas meal of gumbo! 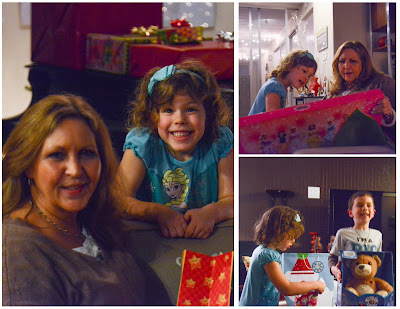 The kids were SO excited about their gifts. Jackson is blurry in the picture below because he was jumping up and down with excitement over his message bear, which he'd been wanting so everyone can leave him messages...we're still working out the bugs, but let us know if you want to send him a message. He'd love it! We all went to church and brunch on Sunday morning. Then we split up to enjoy some different activities. Ross and Susan went to a bowling alley to watch the Cowboys game, which they won, and my mom, the kids, and I made our way to San Francisco to visit the zoo and Union Square. My mom left early Monday morning. 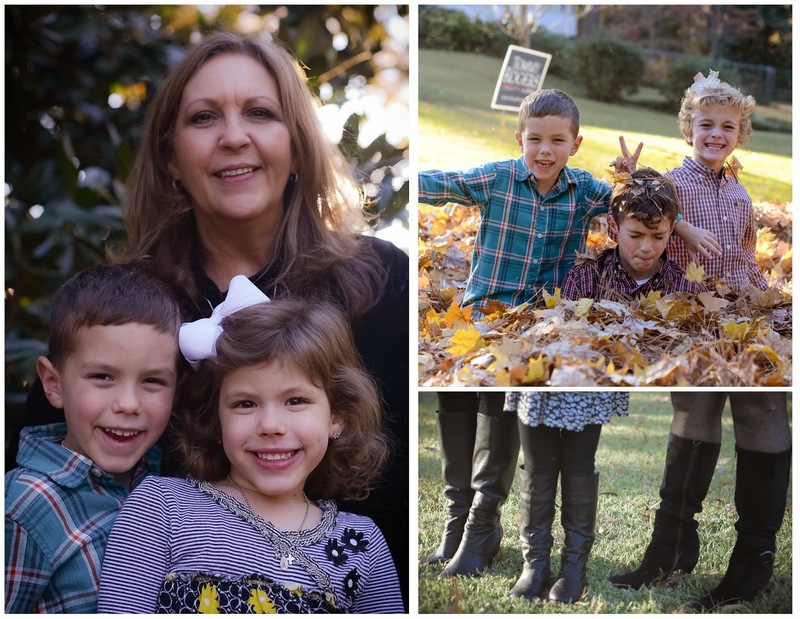 I took the week off with the kids and Susan while Ross worked most of the week getting ready for the Consumer Electronics show in January! 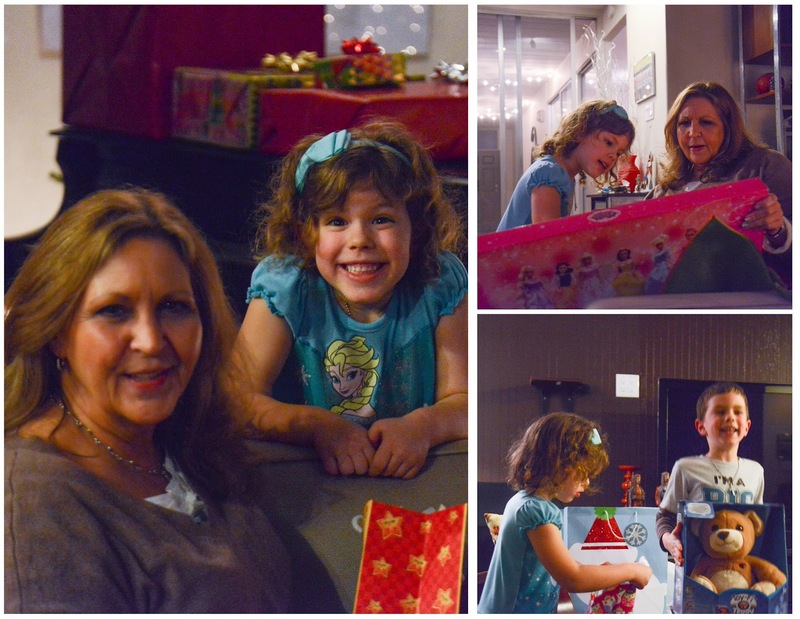 We spent the early part of the week wrapping presents, finishing shopping, baking cookies, and playing around. On Christmas Eve, we spent the morning decorating cookies for Santa. They were good! We had a delicious meal cooked by Chef Ross before heading to the Christmas Eve service. 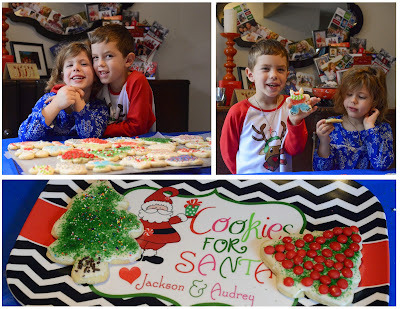 Jackson said our prayer before supper that evening, which included thanking God for making Santa so we could celebrate Jesus' birthday in such a fun way...so cute! The kids loved both the music and the message at church, and they went to bed faster than I've ever seen when we got home! 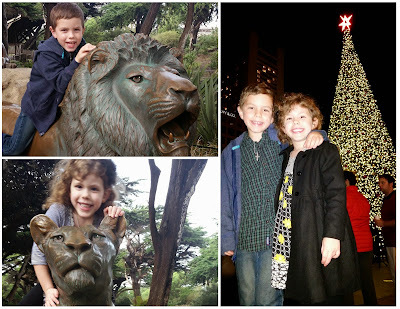 They are at such a fun age to enjoy the Christmas season right now! Jackson was the first one awake, and he waited patiently in our room for Audrey to wake up. Once she was up, it was a mad dash to their stockings! 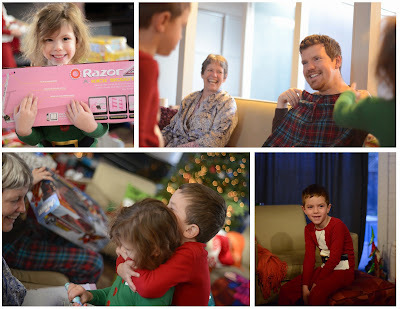 We were all pretty spoiled this year. 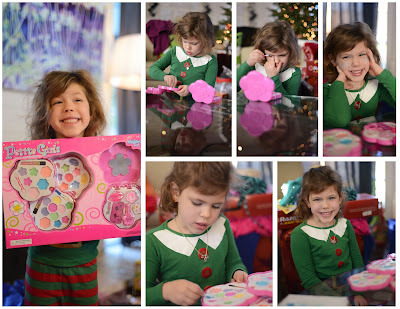 It was so fun to see the pure joy on the kids faces as they opened their gifts, screamed in excitement, and jumped up and down in celebration over things as simple as a new bath scrubber! The picture above where it looks like Jackson is choking Audrey is actually him hugging her for the gift she chose for him...a flying Iron Man! After the chaos settled out, Jackson and Ross both got to play with their new remote controlled toys (Ross got a car that drives and flies). 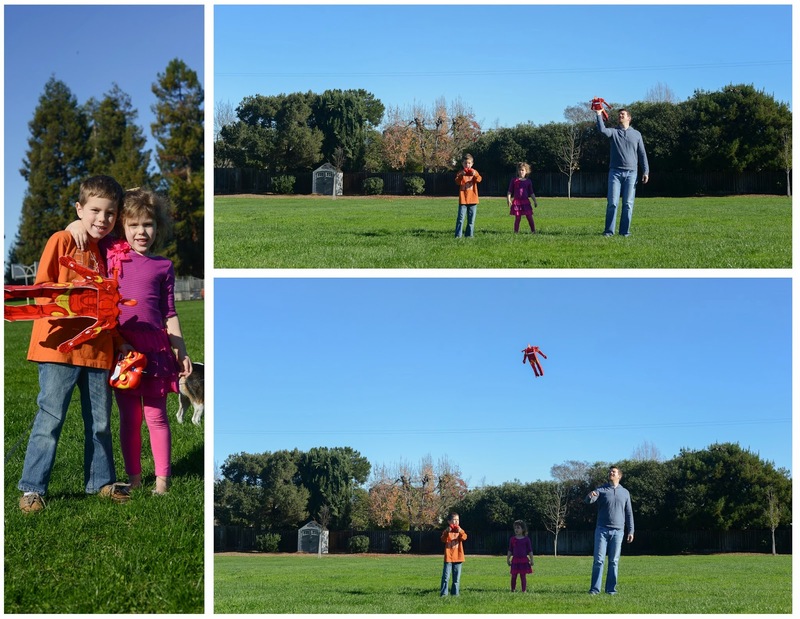 We were impressed with how well Jackson did with it! Audrey was most excited about her makeup set, which she quickly started using. I love that her first application included blue blush...after all, blue is her favorite color right now! As the day progressed, some of the more complicated toys were opened. 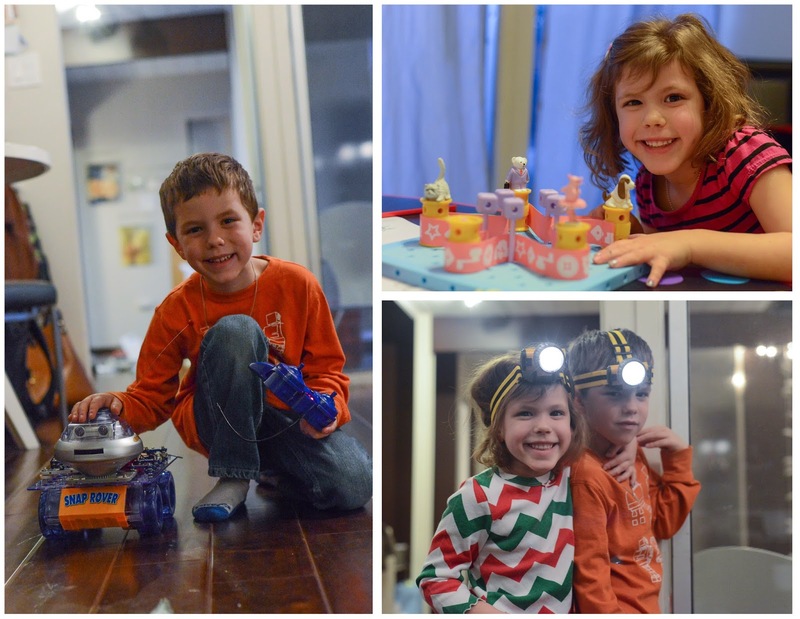 Jackson LOVES Snap Circuits, and he got two new sets for Christmas (lights and a rover). He put the rover together and had lots of fun recording and delivering messages on it, as well as shooting discs at Audrey! Audrey put together one of her Goldie Blox sets, which was really cool to see! It teaches engineering principles in a way that engages young girls really well. She was so proud of her work! At the end of the day, the kids were wearing their head-lamps from Grandmother and measuring things with Jackson's new measuring tape, which broke fairly quickly and provided entertainment for the adults and kids as we took it apart and fixed it. The adults ended the day playing games and laughing at ourselves. 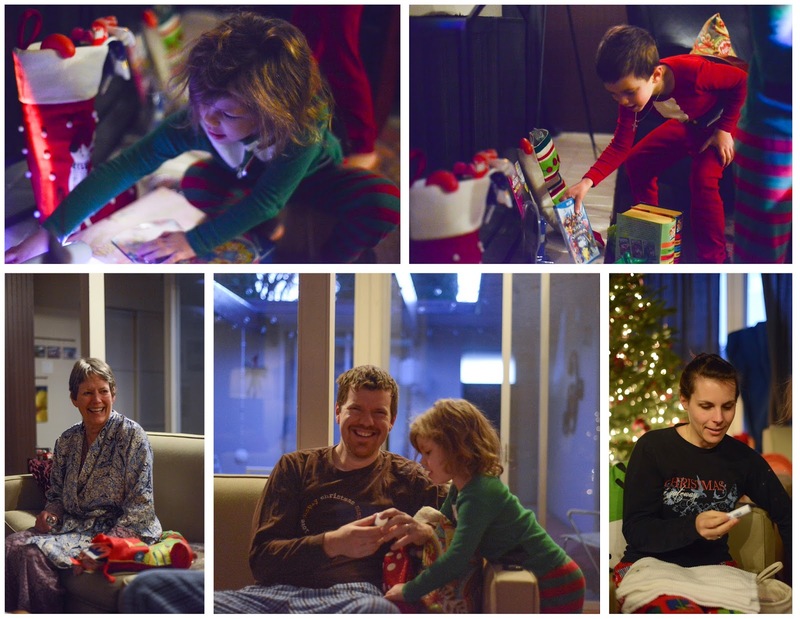 It was a wonderful Christmas! If you didn't get enough, there are more pictures in the album! Jackson was selected to be a "Citizen of the Month" for his class in December. Each month the school focuses on a particular character trait and the teachers select students from their classes that best represent those traits each month. This month's character trait was "caring." Jackson's teacher very quickly recognized his caring nature, and this month he really showed that side of himself by helping a new student make friends and get comfortable at their school. I imagine he could relate to that kiddo pretty well having been the new kid not that long ago! We are all so proud of how hard he is working to make good choices and to be such a caring kid! It was extra special that Grandmother and Nana could be there for the assembly where he was recognized! Here is a part of the email from Jackson's teacher letting us know why she selected Jackson for the "caring" trait...I have seen him demonstrate this important life skill many times, especially this month. We had a new student join us this week and Jackson volunteered to be his buddy for lunch. He also has been very thoughtful. He told me that you taught him, it's important to love all of God's children. It's wonderful to see how he internalizes important lessons and goals. He has also demonstrated caring when he read his behavioral books to the class. He is really striving lately! While Jackson struggles at times (we all do! ), it's awesome to see others recognize what an amazing heart he has and how much he loves God! There are more pictures in the album! 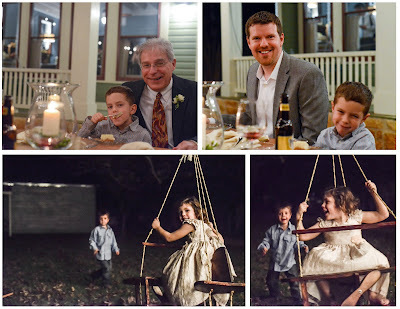 After Thanksgiving, we made our way to Fredericksburg, TX for another wedding, my Dad and Barbara's. 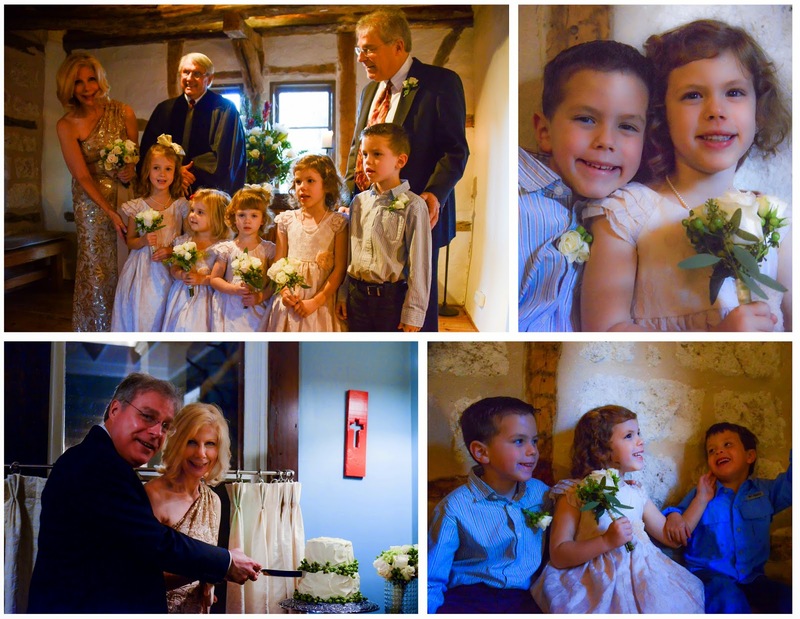 Jackson was the best man, and Audrey was one of the bridesmaids along with the other granddaughters. It was a wonderful celebration with such wonderful people. All of the grandkids sang "Jesus Loves Me" as part of the ceremony, which was so sweet. 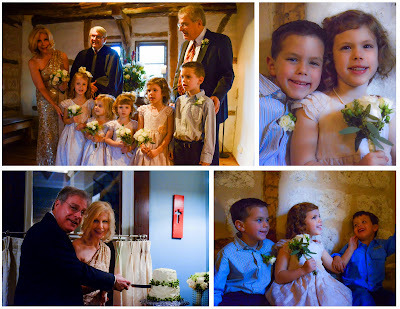 Their very dear friend, Mack McCarter, performed the ceremony at a beautiful, little chapel, and the reception was held at Barbara's daughter's house, which was the perfect place to entertain this group. 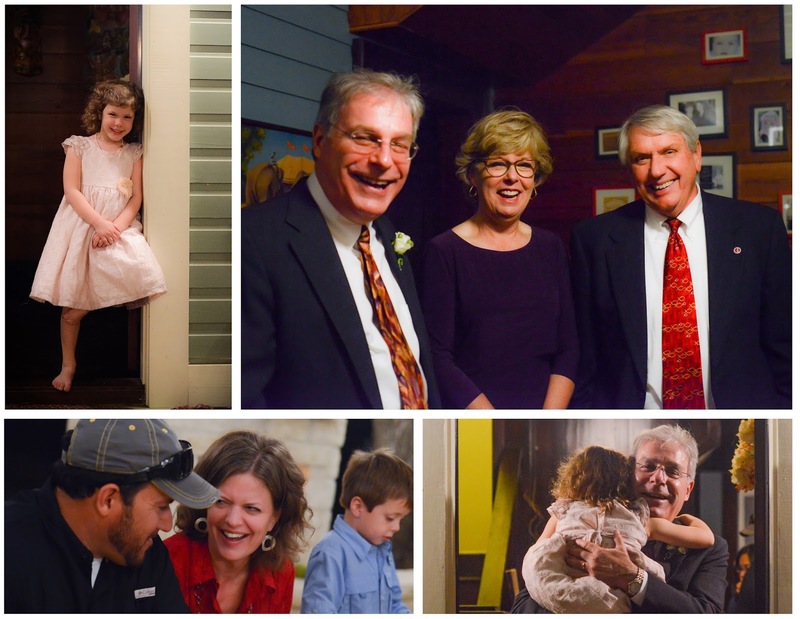 It was wonderful to spend time with people who love our family so much. Jackson and Audrey had so much fun they didn't want to leave Texas again! We felt such a warm welcome from all of Barbara's family. It made for a wonderful celebration as our families joined together. The end of October and November were busy times for us. I wish I could tell you we did all kinds of fun stuff, but I really don't remember! 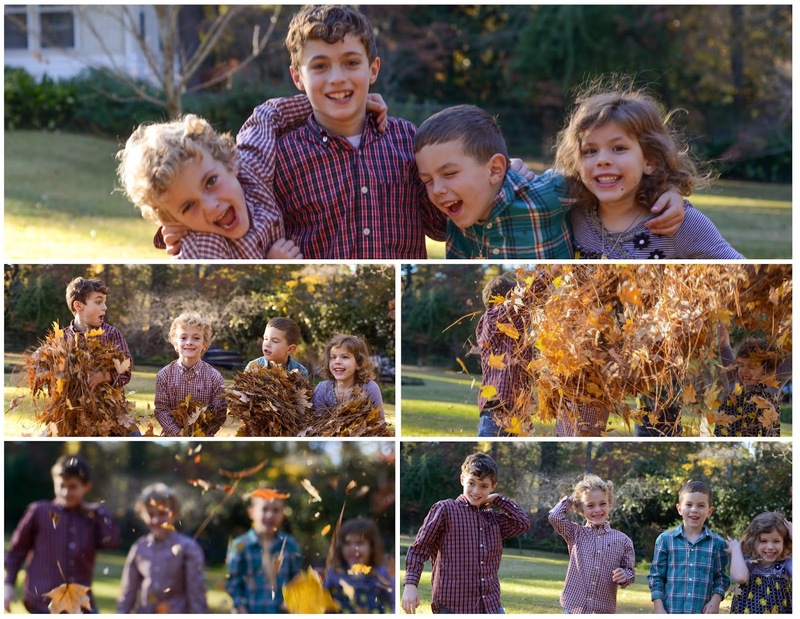 What I do recall is that we wrapped up soccer season and enjoyed the beautiful fall colors around town. I worked a ton, but I also got to go to Arkansas for my cousin Ben's wedding. It was so great to see family and to get back to the south for a bit. The wedding was Halloween weekend, so Ross took the kids trick or treating with our friends from life group. Before we knew it, Thanksgiving was here! The entire family made the trip to Louisiana to celebrate. We had a delicious homemade, southern-style Thanksgiving dinner at my grandparent's house. We got to visit with most of my mom's side of the family and some of our best friends, The Tims. It was an amazing day! The next door neighbors had a perfect pile of leaves, which made for the perfect place to play! There was a lot of laughter and fun had by all! Four generations together under one roof is so special! We even captured three generations of black boots at my mom's request. There are more pics from Thanksgiving in the album!